We were excited to join the likes of Gary Cunningham and Ron Wommack among other Dallas architects in this month's Columns Magazine. "...When creating something, making a statement is inevitable. What should be said? Should it be whispered or yelled?" 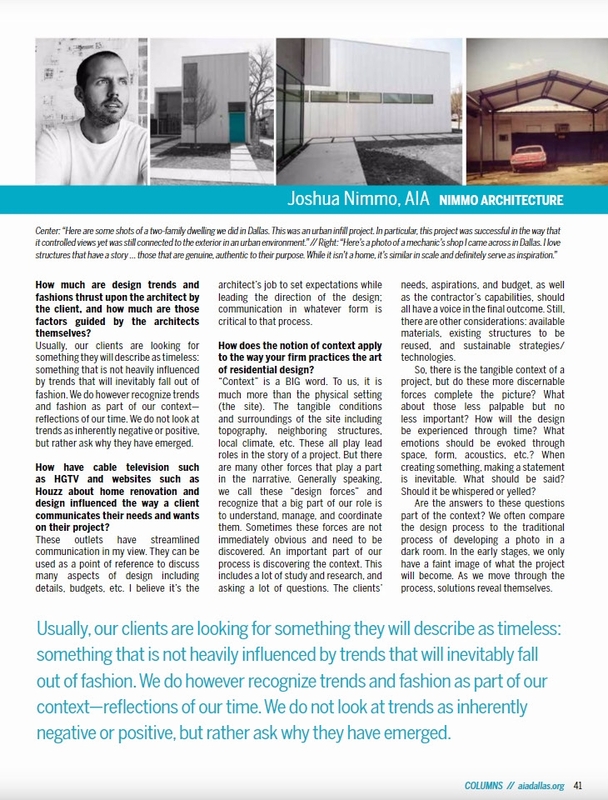 How much are design trends and fashions thrust upon the architect by the client, and how much are those factors guided by the architects themselves? Usually, our clients are looking for something they will describe as timeless: something that is not heavily influenced by trends that will inevitably fall out of fashion. We do however recognize trends and fashion as part of our context—reflections of our time. We do not look at trends as inherently negative or positive, but rather ask why they have emerged. How have cable television such as HGTV and websites such as Houzz about home renovation and design influenced the way a client communicates their needs and wants on their project? These outlets have streamlined communication in my view. They can be used as a point of reference to discuss many aspects of design including details, budgets, etc. I believe it’s the architect’s job to set expectations while leading the direction of the design; communication in whatever form is critical to that process. How does the notion of context apply to the way your firm practices the art of residential design? “Context” is a BIG word. To us, it is much more than the physical setting (the site). The tangible conditions and surroundings of the site including topography, neighboring structures, local climate, etc. These all play lead roles in the story of a project. But there are many other forces that play a part in the narrative. Generally speaking, we call these “design forces” and recognize that a big part of our role is to understand, manage, and coordinate them. Sometimes these forces are not immediately obvious and need to be discovered. An important part of our process is discovering the context. This includes a lot of study and research, and asking a lot of questions. The clients’ needs, aspirations, and budget, as well as the contractor’s capabilities, should all have a voice in the final outcome. Still, there are other considerations: available materials, existing structures to be reused, and sustainable strategies/technologies. So, there is the tangible context of a project, but do these more discernable forces complete the picture? What about those less palpable but no less important? How will the design be experienced through time? What emotions should be evoked through space, form, acoustics, etc.? When creating something, making a statement is inevitable. What should be said? Should it be whispered or yelled? Are the answers to these questions part of the context? We often compare the design process to the traditional process of developing a photo in a dark room. In the early stages, we only have a faint image of what the project will become. As we move through the process, solutions reveal themselves.